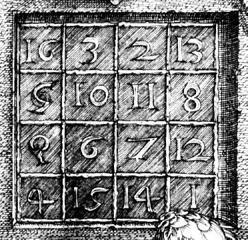 With origins in centuries old recreational mathematics, magic squares demonstrate MATLAB array operations. The column sums are the same, but the row and diagonal sums are not, so this is not a magic square. sums the main diagonal of A, which runs from upper left to lower right, to produce 15. The opposite diagonal, which runs from upper right to lower left, is less important in linear algebra, so finding its sum is a little trickier. One way to do it makes use of the function that "flips" a matrix "upside-down." The 5 is always in the center, the other odd numbers are always in the centers of the edges, and the even numbers are always in the corners. produces a 4-by-4 magic square. yield enough 34's to verify that A is indeed a magic square. The 4-by-4 magic square generated by MATLAB is not the same as Dürer's magic square. We need to interchange the second and third columns. The program durerperm available from Experiments with MATLAB interchanges rows and columns in the image produced from detail by interchanging groups of rows and columns in the array X. This is not especially important or useful, but it provides a curious illusion. 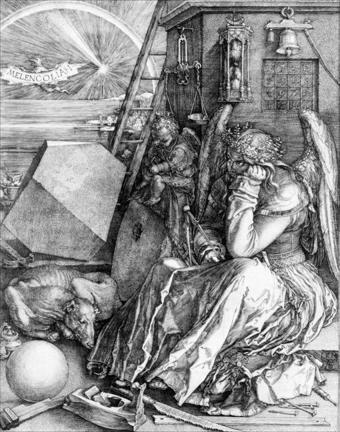 http://en.wikipedia.org/wiki/Associative_magic_square The very end of the article in the link above shows a 14 x 14 magic square tribute to the 500th anniversary of Durer's square. Two recent programs in the ref section make this magic square calligraphy possible.